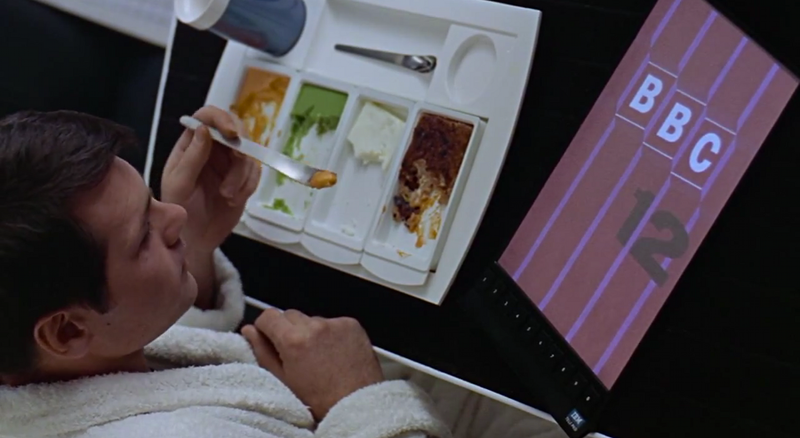 Although the Apple v. Samsung trial didn't meet in court on Thursday, Judge Koh filed an order denying six Samsung attempts to invalidate Apple's patents including an argument leveraging fictional devices seen in Stanley Kubrick's 1968 sci-fi classic "2001: A Space Odyssey." Samsung's intention to use the devices against Apple was first revealed in a 2011 opposition filing where the Korean company points out a scene in which astronauts are "using personal tablet computers." The citation was meant to validate the "Space Odyssey" devices as prior art. In a previous filing, Judge Paul Grewal ordered the evidence be barred from factoring into Samsung's prior art claims and Thursday's order from Judge Koh agrees with his assessment. Thursday's order was in response to Samsung objections against Judge Grewal's findings. Judge Koh notes in her order that while Samsung did present the evidence during the preliminary injunction briefing, the company "did not disclose that it intended to use the evidence to support its infringement and invalidity theories" until after the close of discovery. Due to the change of tactics, Apple didn't have the necessary time to find appropriate counter evidence through fact discovery, thus Samsung's motion for relief from Judge Grewal's order was denied. Also during the preliminary injunction stage, Samsung argued the 1994 Fidler Tablets and the Compaq TC1000 rendered Apple's D504,889 patent for a tablet computer obvious but failed to note the prior art references would later support non-infringement claims. For the same reasons as the "Space Odyssey" denial, the Fidler and Compaq exhibits won't make their way to court. 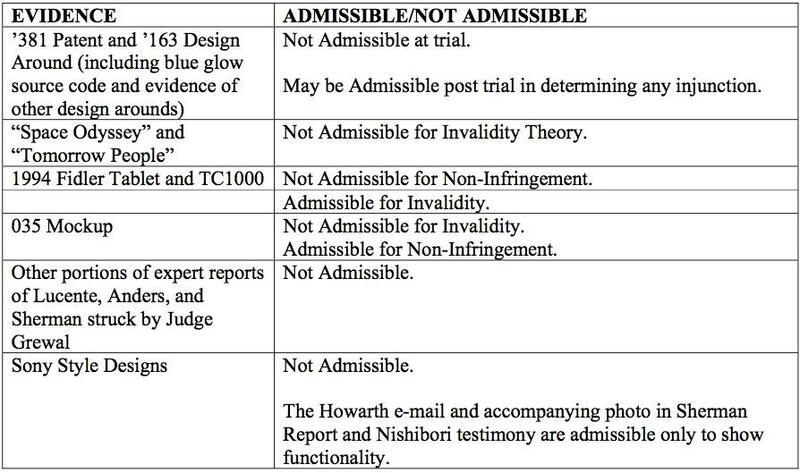 In addition to the two prior art claims, the order summarizes the inadmissibility of expert testimonies as well as a "blue glow" patent which describes a UI function in some Samsung smartphones created to get around Apple's overscroll or "rubber-banding" patent. The judge reiterated that the Sony Stye Design argument, which caused a kerfuffle this week when Samsung leaked the excluded evidence to the media, is also not admissible.